The Global Compact for Safe, Orderly and Regular Migration resets on the principles adopted in the Charter of the United Nations, the Universal Declaration of Human Rights and core international human rights treaties. The zero draft with 22 core commitments of this compact has been released on 5th February, 2018. It has been emphasized from the Bangladeshi delegates that there has to be a strong inter linkage between the Compact and the Agenda 2030 for positive contribution of migrants for inclusive growth and sustainable development. 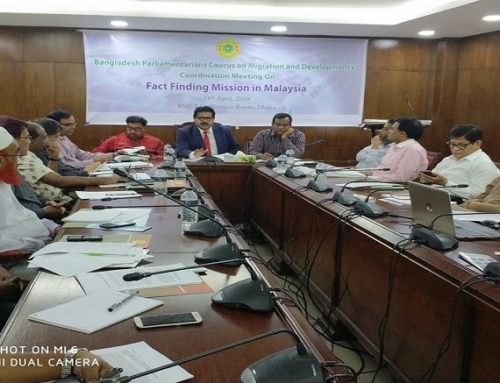 Bangladeshi delegates always recognize throughout the phase 1 and phase 2 that international migration is a multidimensional reality of major relevance for the development of countries of origin, transit and destination, which requires coherent and comprehensive responses. The successful implementation of its actionable commitments on the ground will be a challenge. Only a robust follow-up and review mechanism may ensure the future implementation of GCM. As well as Global Compact may be seen as the milestone but not the end of our efforts to address the issue of migration holistically. It is believed that similar dialogues and constructive engagement of parliamentarians on migration needs to be arranged on a regular basis at regional and global levels. 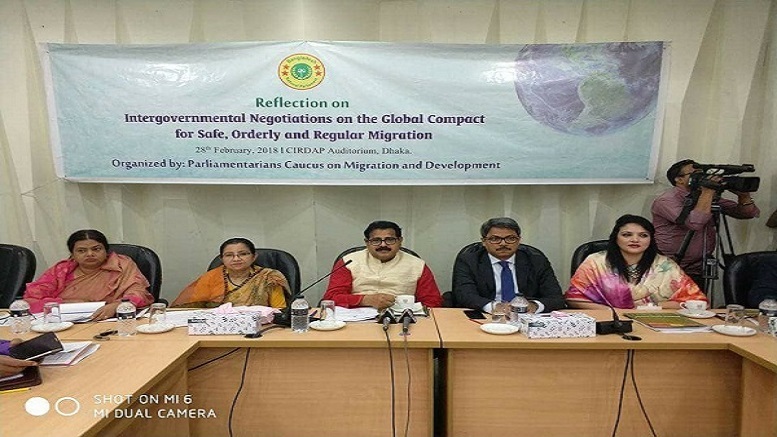 Parliamentarian Caucus on Migration and Development organized a program to reflect the Intergovernmental Negotiations on the Global Compact for Safe, Orderly and Regular Migration with multi stakeholders on 28th February, 2018 at CIRDAP Auditorium. Honorable State Minister Mr. Md. Shahriar Alam, MP, Ministry of Foreign Affairs (MOFA), Government of the People’s Republic of Bangladesh graced the occasion as Chief Guest. In this program, Mr. Md. Israfil Alam, MP, Chair of Parliamentarian Caucus on Migration and Development was the chair of the program and he moderated the entire program. Ms. Nahida Sobhan, Director General, (MEA), Ministry of Foreign Affairs talked about the Government’s Negotiation on GCM. 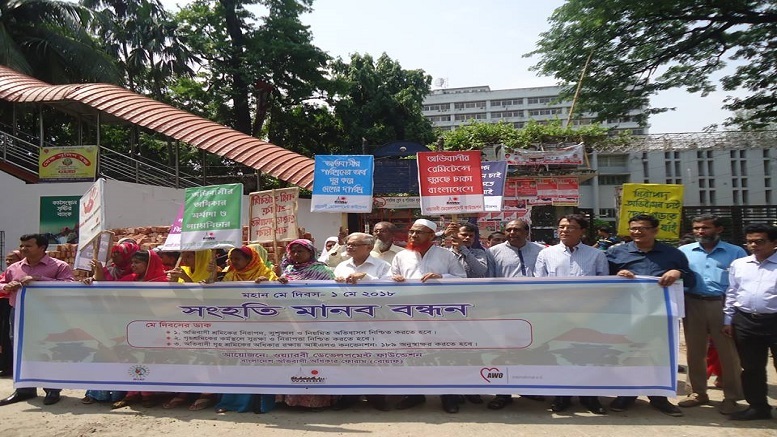 Mr. Syed Saiful Haque, Chairman, WARBE Development Foundation, briefly reflected the civil society’s stand on GCM. 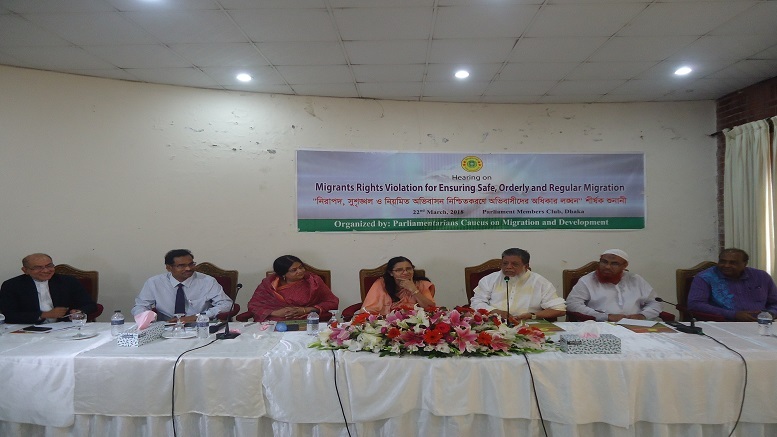 As honorable Guest Speakers, Ms. Advocate HosneAraLutfa Dalia, MP, Member of Parliamentarian Caucus on Migration & Development (PCMD), Ms. Roksana Yasmin Suty, MP, member of PCMD, Ms. Jebusnessa Afroz, MP, member of PCMD, Mr. Selim Reza, Director General, Bureau of Manpower Employment and Training (BMET). 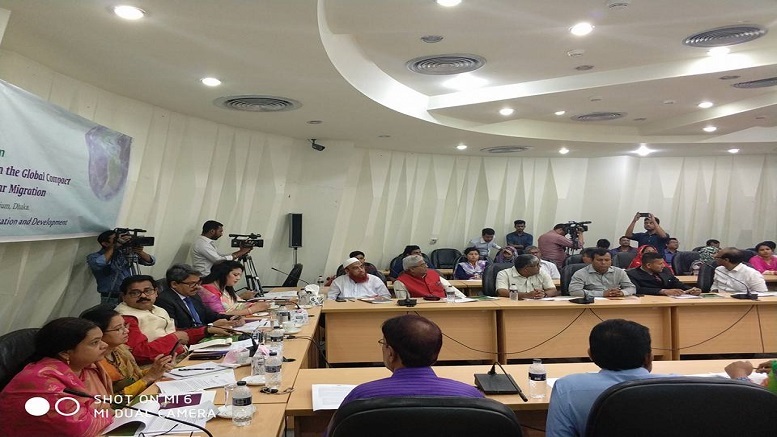 Lawmakers, officials from foreign and expatriate welfare ministries, civil society members, trade union leaders, national & international NGOs, migrant rights activists, returnee migrants & migrants family members and senior journalists who took part in the consultation. Ms. Nahida Sobhan, Director General, (MEA), Ministry of Foreign Affairs, said that GCM is the brainchild of Bangladesh. She mentioned that Bangladesh has been trying to create a global treaty for the countries which will be binding in nature or partially binding. In the zero draft of GCM, it has been mentioned that this compact will be legally non-binding in nature. 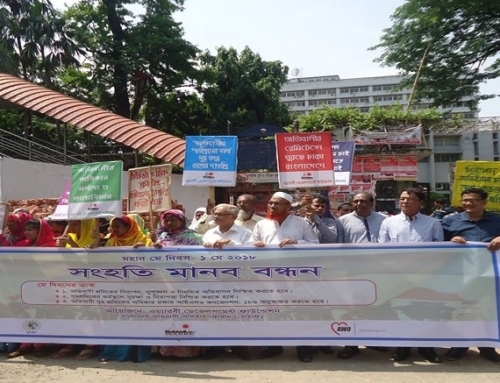 Bangladesh has put a strong dissatisfaction on this issue. Bangladesh has taken part in different bilateral meetings on this issue. She mentioned that Bangladesh is taking strong stand on the migration issue in the UN headquarters on the zero draft of GCM. She mentioned that in the zero draft of GCM Climate induced migration has been included. Mr. Syed Saiful Haque, Chairman, WARBE Development Foundation, briefly talked about the GCM and how the civil society is involved with the GCM. He said that since 2016, at the GFMD, GCM discussion started taking place. CSOs has organized and participated in different National, Regional and Global Level Consultation on GCM. He mentioned that CSO has presented a Global Civil Society Recommendation for GCM, Now and How: Ten Acts for the Global Compact: A civil society vision for a transformative agenda for human mobility, migration and development. He also mentioned the Preparatory phase of GCM where the CSOs intervened. 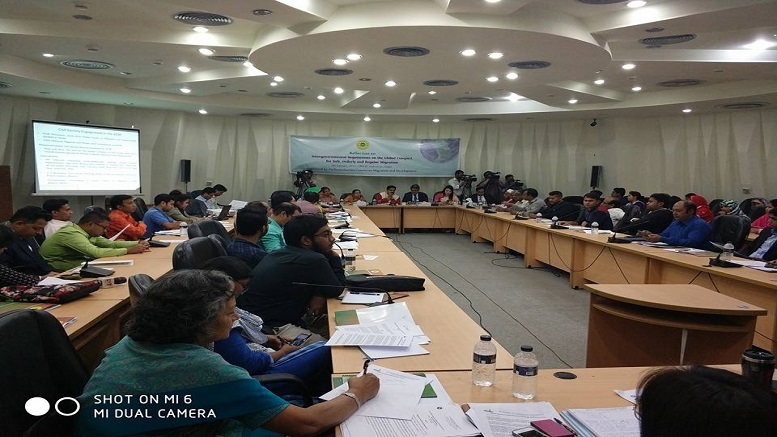 In the open discussion session Ms. Ishrat Shamim, Executive Director, CWCS, said that lack of enough segregated data in the migration sector creates various problems. She strongly suggested creating database for returnee migrants. She also mentioned to separate domestic worker’s law from the migrant workers’ law. 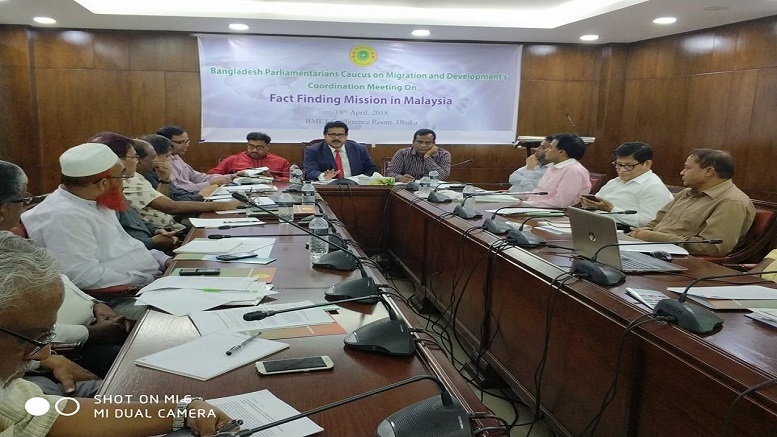 Mr. Faruque Ahmed, Secretary General, WARBE Development Foundation, requested to take immediate action for the safety of migrants and said that GCM should be binding in nature. Mr. Binoy Krishna Mollik, Executive Director, Rights Jessore, talked about remittance management issue, high migration cost and middlemen issue. He also mentioned that awareness will help to minimize the migration problems. Mr. Assaduzzaman, Returnee Migrant worker, talked about creating more labour wings in KSA for the migrant workers. He mentioned that it takes almost 3 lakhs taka to renew the akama, which is very inconvenient for the migrant workers. Mr. Keramot Ullah Biplob, Senior Reporter of ATN Banglatalked about getting diplomatic help for the migrant workers. He also said that the numbers of people going abroad are not getting enough services. He said that government should go for more bilateral agreement for the betterment of migrant workers. As honorable Guest Speakers, Ms. Advocate Hosne Ara Lutfa Dalia, MP, Member of Parliamentarian Caucus on Migration & Development (PCMD), Ms. Roksana Yasmin Suty, MP, member of PCMD, Ms. Jebusnessa Afroz, MP, member of PCMD shared their experience of participation in Global Compact and IPU and strong role of Bangladesh Government on GCM. They also stressed the need for creating awareness among the migrants about zero migration cost for women workers. Mr. Selim Reza, Director General, BMET, said that both sending and receiving countries should be responsible for creating safe migration. He mentioned that the model that we created for sending migrant workers in Korea is ideal to follow. Because the labor law for the Korean workers and the migrant workers is the same. He mentioned that there are many developments in the migration sector that have happened recently. He said that women migrant workers are now going abroad without migration cost. He mentioned to work together to solve problems in the migration sector. He said that there is nothing called free visa. Mr. Md. Shahriar Alam, MP, State Minister, MOFA, he pointed out the link between SDGs and Migration. 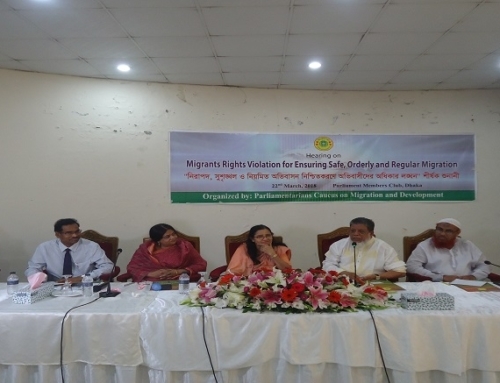 He mentioned that Government of Bangladesh has taken a lot of steps to ensure safe migration. He also thanked all the NGOs, Civil Society and Think tanks. He mentioned that government has given inputs and recommendations on GCM continuously. He said that the main concern from the Bangladeshi delegates is to protect basic human rights of migrant workers. He mentioned that recently United Arab Emirates, permitted male and female domestic to work there as well as the professionals. He said that we are exploring different markets for the migrant workers. He also mentioned to have a SOP with the EU to bring back the migrants who are imprisoned in different countries in the EU. 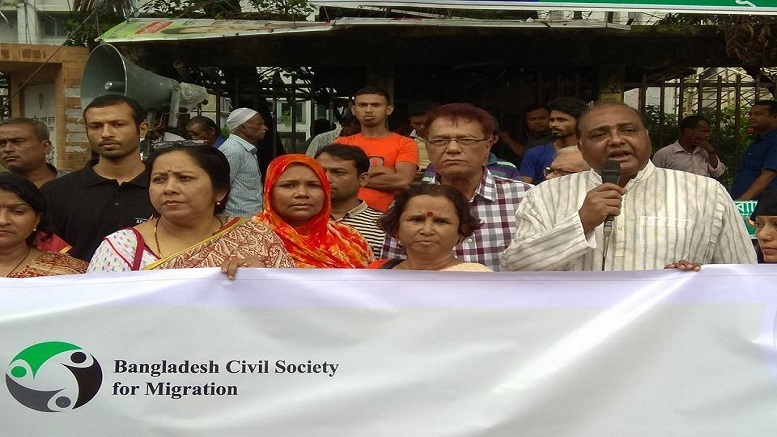 Mr. Israfil Alam, MP, Chair of PCMD, mentioned the necessity of the Global Compact on Migration. He said that this caucus has organized different multi stakeholder consultations in the District, Divisional, National level where they directly talked with the survivors of migrants rights violation, middlemen and the administrators. He said that the caucus took the suggestions from the grassroots level and tried reflect those suggestions in the different pre meetings of GCM. He also mentioned that the zero draft of GCM is not what Bangladesh would want to see as GCM. 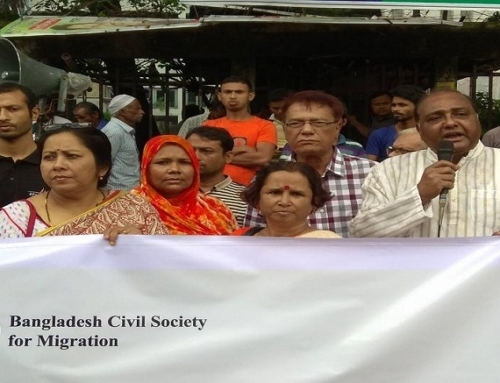 He said that in the recent hearing of IPU, at the UN Headquarter, the delegates of Bangladesh raised their voice on the issue of fair migration process and protection of Migrants’ rights. Create a plan of action regarding the prevention of irregular migration and for prosecution of migrant smugglers and human traffickers, collaborate to stop illegal monetary transactions, allocate budget for rescue operations and assistance programs for undocumented migrants. GCM framework should be normative and binding. The implementation of the framework will be ensured with sheer responsibilities of the participating countries.